Now that our year in Challenge A is complete, I can reflect and write. Readers have emailed lots of questions about Challenge A. I've had tons of thoughts swirling in my head about how I will do Challenge A differently when my son gets to that point. I want to share in the hope it will help others - and to document the most exceptional year of our homeschool journey thus far. Challenge A can be a shock to a child's (and a parent's) system. I cleared our schedule of anything that wasn't absolutely necessary so we could focus on having a productive school year. I knew going in that this year was going to require a lot of ME, the parent. The Challenge program is technically a drop-off program, but that doesn't mean you can CHECK OUT if you are the parent. You must stay involved, learn with your child, and be there to guide them through this year of maturation, increased independence, and a new found wealth of knowledge! First, these are the thoughts of a mom and her daughter - I am not employed by Classical Conversations, nor do they endorse or sponsor these posts. Second, I do not claim to be an expert - simply learner in charge of our homeschool. Please read the description of the Challenge Program from Classical Conversations to receive a thorough overview. Anna's year in Challenge A brought such spiritual, emotional, and academic growth. "Education is guiding students into relationship through relationship." Not only did she learn to defend her faith, but she also packed so many facts into her brain - including how to draw the entire world from memory, labeling and drawing all the systems of the body, memorizing countless catechisms, accomplishing Saxon 8/7 math, completing one year of Latin, and learning to write a persuasive essay. Add to this the friendships, discipline, and just the sheer fact that she proved to herself she could DO IT and I would deem the year 100% successful. Know that your student will fail in some aspects of Challenge A. That is part of the process. Let them fail and take accountability for that failure. Do not bail them out. Use these failures as learning experiences and grow from them. Celebrate the successes and remember all of the hard work your child is doing! Put yourself in their shoes every now and then. Read The Question before you jump into Challenge A. It is such a helpful book Leigh Bortins has written for us! I see so many people pose the question in Facebook groups and also to me in emails, "Can my child have no prior experience in Classical Conversations and be OK in Challenge A?" It will require some extra effort, especially in the areas of Latin (grammar) and Geography, but it CAN be done. Just be prepared to buckle down and WORK! If you can swing it at all, a year of Foundations and Essentials would be very helpful. I wish we had done this with my daughter, but we didn't. She was a very mature 12 year old and a great reader. We were already making a big change joining CC and I didn't want her to feel that I was "holding her back" since Challenge A roughly equates with 7th grade and that's where she was at. God also put her right where she should be... had she entered Challenge A this year she would be the only girl in the group! Having a younger brother in Foundations exposed her to the weekly memory work. So much of that valuable information really helps in Challenge A. Yes, we used Saxon 8/7. We did everything as prescribed in the Challenge guide. This consisted of a lesson each day, and sometimes (when a test was scheduled) a lesson on the weekend as well. If we did not keep up this pace we would get behind, and that is NOT good. My daughter also used the Saxon Teacher Lesson and Test CDs. These CDs proved invaluable (especially for me because math is not my forte). In the first semester the students researched different topics (wildflowers, marsupials, fungus, and many others!) and completed an outline and sketch on each topic. They also presented this to their class. This sketchbook is something Anna will look back on with pride and accomplishment. Second semester brought the incredible knowledge of the human body, including the ability to draw (from memory) and label all of the major systems. Purchase a couple of lap size white boards and lots of Expo markers. These will come in handy while your child practices sketching! This was my daughter's favorite subject. She loved the texts, Don't Check Your Brains at the Door, and It Couldn't Just Happen. She also memorized over 50 catechisms - and if I can brag - she was GREAT at this! Her final rhetoric paper was a persuasive essay about why Secular Humanism is a flawed world view. Yes. My 12 year old dug DEEP into that subject and delivered it beautifully to her class at the end of the year. Pretend you are the Challenge A student and read the assignments yourself. The discussions that will take place in your home will astound you. The crux of Challenge A is DISCUSSION. Schedule a couple of hours each week to just discuss things with your child! This was MY personal favorite strand in Challenge A. Each week my daughter would draw a section of the world from memory. She would learn the countries and their capitals. She would learn the geographic features and also define geography terms. When I look back on the year I cannot believe she did it all. I challenge any adult to do what these kids did in one year. Have your children trace A LOT. I would have my daughter trace the entire continent (on the first day of our school week), and in the subsequent days she would draw freehand. She made beautiful tracings (using maps we found in the Challenge tier of CC Connected) that served as a guide for her freehand drawings. Stock up on notecards... make a notecard for each country/capital and each geography term. Don't forget that your Challenge A student still likes to play games. Our tutor played many of them with the kids, and we would play at home, too. Review Jenga was our favorite... as Anna would pull out a block I would quiz her on a country and its capital. Simple, but very fun. The Lost Tools of Writing is an exceptional program. At times, however, it may feel like your child's writing is moving backwards, almost becoming elementary. This is the point. Trust the process. I will admit that I abdicated a lot of this instruction to our wonderful tutor, Miss Nancy. I should have been more on top of things, but I am vowing to improve in this area for Challenge B. The literature selections were easy for Anna, but they are designed to be below grade level so the children can focus on writing their papers and digging deep for ideas. She did NOT read any of the books ahead of time. I found it helpful for Anna to have them fresh in her memory. In the guide they are given one week to read a book, and that was plenty of time. Faithfully read the lessons (and watch the DVD) in your Lost Tools of Writing Teacher's Guide. You will be so glad you did. Trust me. Purchase Words Aptly Spoken. This book provides great questions for you and your student to encourage conversation about the book. I think this is the biggest "freak out" area for parents and students. I won't lie. It was hard. BUT, this is good. After one year of Latin I can see my daughter's discipline, understanding of grammar, and understanding of the English language improving. Henle Latin is a very thorough book and I thought the pace at which Challenge A moved was swift. Take heart, however, because the same information is presented AGAIN in Challenge B, and then the students move a little bit faster and farther through the book. We did not have prior Latin experience and everything was just fine. It wasn't easy. But who said things are supposed to be EASY? Be disclipined and don't get behind in Latin. Write everything out in your Latin notebook. Practice writing your declensions daily. Make flashcards and drill daily. Did I mention don't get behind? We have decided to make Latin time a very special, set aside time for just Anna and me. This summer we have been hitting our local Starbucks and studying Latin together - faithfully. This has made Anna feel very studious (lots of college kids studying at our Starbucks!) and allows us to get out of the house and minimizes the distractions. I realize we won't always be able to do this, but to give us a good start for Challenge B Latin I've started this fun tradition. *Confession: In the spring of this past year (towards the end of Challenge A), my husband and I had some moments where we wondered what it would be like if Anna attended a private, Christian school. We even went so far as to go to an open house at one school close to our home. The buildings were beautiful. The teachers no doubt were wonderful. The extracurricular activities were available and enticing. When we arrived home I asked my husband what he thought. His comment to me, "It all looked good, but I was just so DISAPPOINTED in the curriculum. It seems so watered down compared to Classical Conversations. I think Anna would be bored to tears if we sent her here." I was relieved, because I couldn't have agreed more. In this moment it was confirmed to me that we are on the right path - a path that, God willing, we can stay on until both of our children graduate. 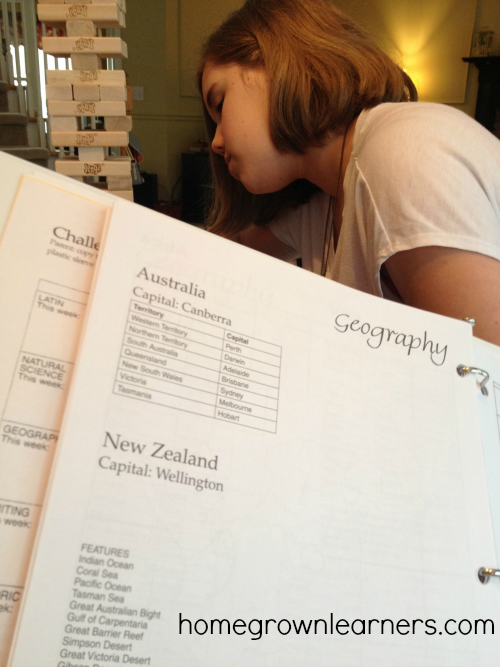 Seventh grade is a pivotal year for homeschoolers. Children are maturing, hormones are raging, and subjects are getting difficult to teach. PLEASE don't lose heart. Classical Conversations is in the business of equipping us to educate our children through high school. You have a community of support (locally and nationally) to help you on your journey. It is SO worth it. At the end of the day, you will know that your chief goal is to "Know God and Make Him Known" -- and isn't that the best gift we can give our children? Let me hear from you! Where are YOU in this CC journey? Are there any other questions you would like answered about Challenge A?